No traffic lights. No franchises. Not one high rise as far as the eye can see. Perfectly manicured streets. Lush greenery, quiet gardens, and pretty ponds with wrought iron benches that beg you to take a load off and daydream about nature for a while. Flowers of nearly every color proudly blooming for all to see — spilling out over stunning straw baskets. And in the midst of it all, a magnificent piece of history that just had a big birthday. Think you’ve died and gone to heaven? You may be right. 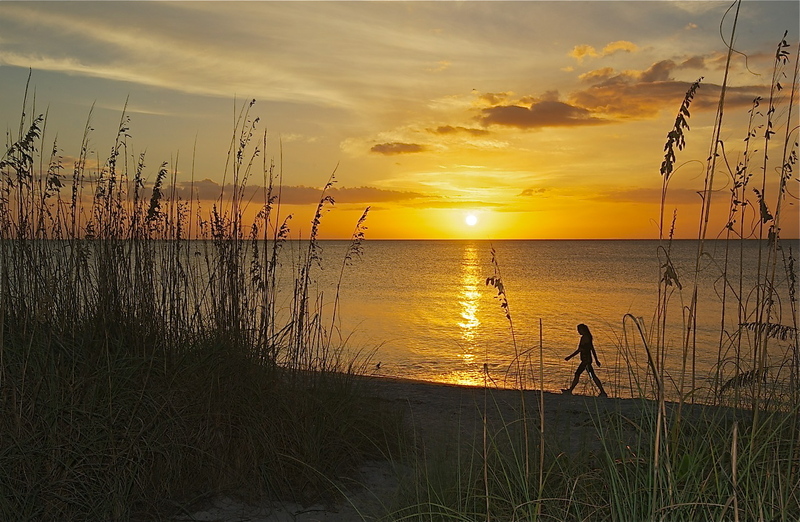 It’s one of the best-kept secrets on Florida’s Gulf Coast. And the locals of this revered island community would prefer to keep it that way. The “it” factor…many describe this as that certain something that makes one stop and immediately take notice. It’s regal. Feels stately. Exudes old-world charm. And upon arrival at this historic landmark, one can’t help but feel like royalty. Tall, majestic ivory pillars greet guests on the approach to the lobby, as do a smattering of rocking chairs and freshly polished wood floors. 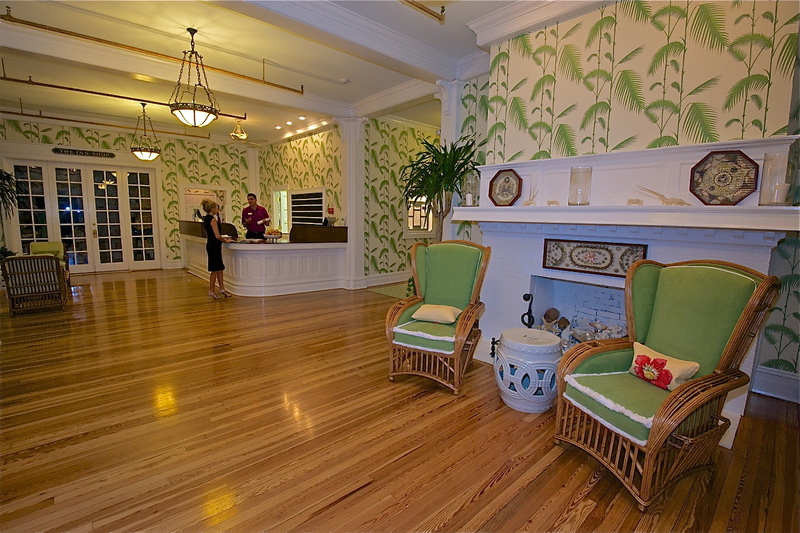 Majestic pillars and white glove service sums up the wow factor upon entering the Gasparilla Inn’s main lobby. 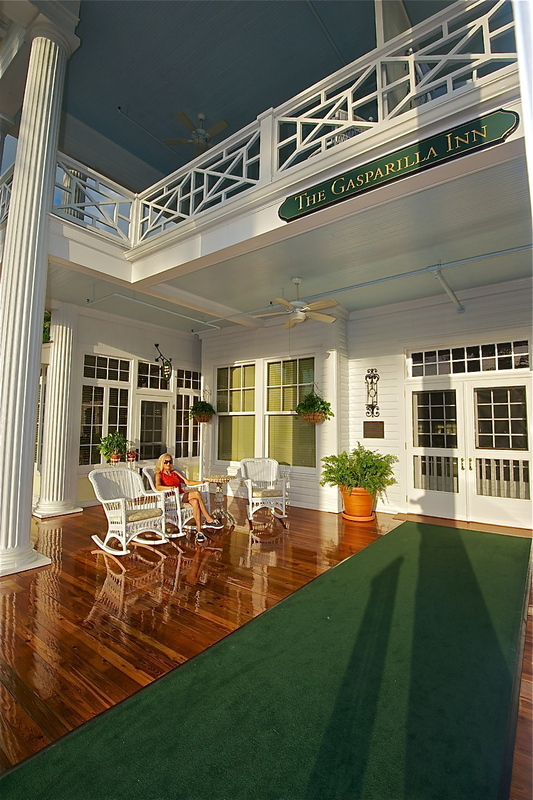 This Grande Dame is none other than the Gasparilla Inn & Club, a perfectly preserved piece of history with two amazing qualities: all the trappings of modern-day comfort, and a signature salute to its past. The resort turned 100 on October 10, 2013 and will celebrate its centennial season until July 6, 2014. 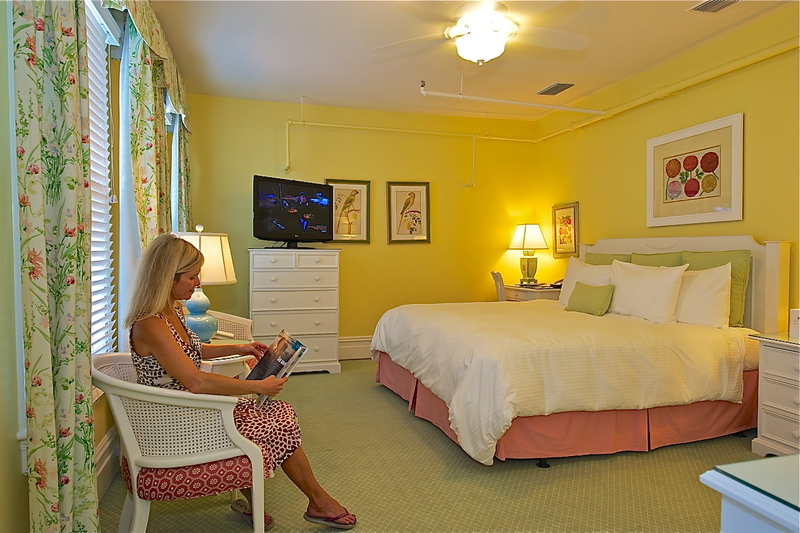 Situated in the heart of Boca Grande, on Gasparilla Island, the Inn boasts 137 impeccably appointed rooms, 63 of them in the main resort, and another 74 in the surrounding cottages. Crisp, red apples happily greet guests at the check-in counter, and two generously stocked gift shops reside in the main areas, with stylish, one-of-a-kind inventory you won’t find at most malls. A whimsical array bright and airy of colors provides the perfect welcome for each guest staying at the Inn’s main resort. The man cave goes upscale in the Inn’s Pelican Room. In a concerted effort to ensure a high level of respect and sense of “specialness,” the resort maintains a published dress code and communicates this to all visitors before arrival. 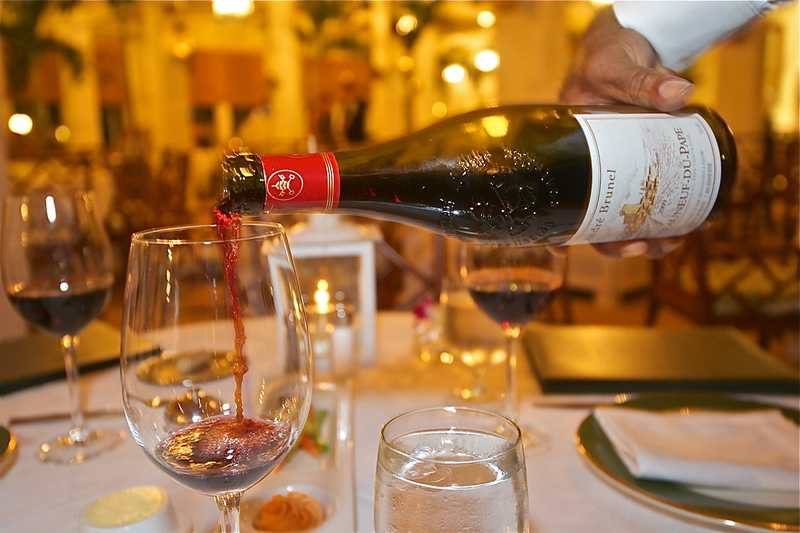 A long and legendary list of the best wines awaits guests at the Inn’s main dining room. In a dining room where guests will never see their meals delivered on a serving tray, Shipley says it’s all done on purpose. “Personalized service is our goal…we didn’t want the food coming out and being stacked in front of our guests.” His creations are both innovative and intriguing. Take the oatmeal pancakes, or the island parfait with layers of creamy Greek yogurt topped with homemade granola, presented in a mason jar, and the appetizing array of dinner entrees on the menu. 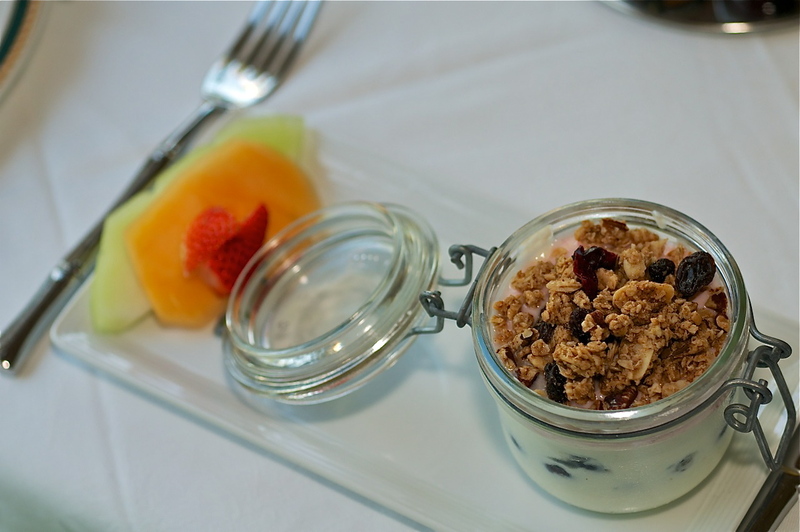 Light and creamy yogurt sprinkled with homemade sweet crunchy granola. Does breakfast get any better than this? He’s the man behind the master plan of taking food to the next level at the Gasparilla Inn. 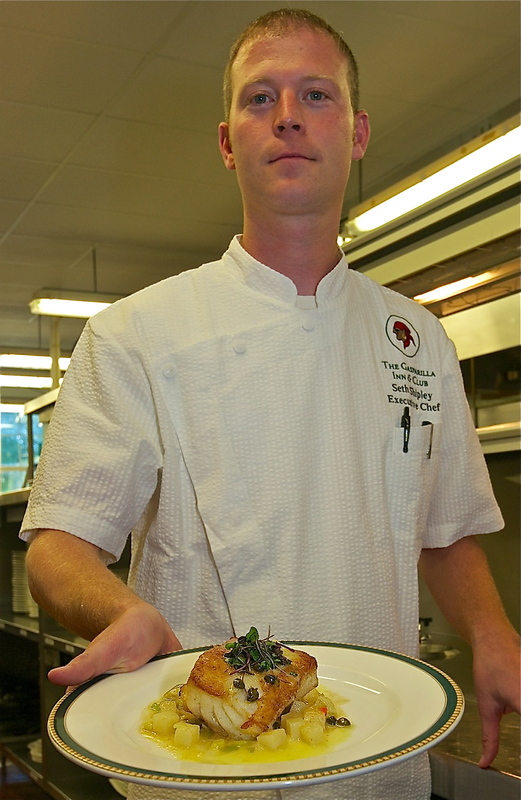 Meet Executive Chef Seth Shipley. Inventive and inspiring, Chef Shipley’s creations are planned and executed with extreme precision. He’s actually cooking on the line 90% of the time, tasting, crafting and preparing the final menu, which gets printed daily at 3pm only after many tweaks and tastings. To see where it all begins, take the Inn’s behind the scenes weekly kitchen tour and witness the labor of culinary love this Chef has created in the form of high-tech, high efficiency and high quality food. Besides the main dining room, the Inn also offers a variety of dining options such as the Pink Elephant, The Inn Bakery, BZ’s (just off the main lobby,) and the Beach Club. Pack your most impressive white wardrobe for this outing. You’ll need it to look the part on one of the three USCA-certified croquet lawns at The Gasparilla Inn & Club. A favorite pastime of the rich and famous can now be your playground as a guest at the Inn. Try your hand at this timeless tradition with the backdrop of the majestic Inn and a sprawling golf course in the distance. The Croquet Club features a full Championship English Rule croquet court, with complimentary balls and mallets. Did someone say Croquet? Grab your mallet and best set of whites on this stellar set of courses. 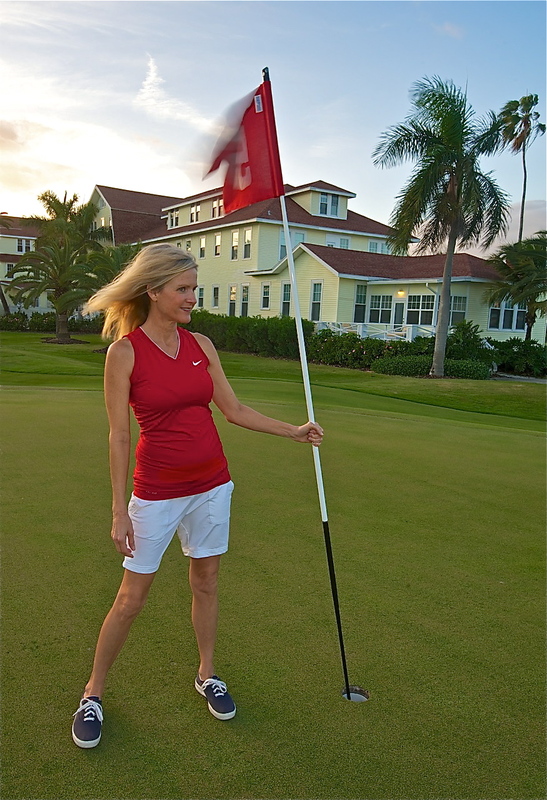 From March 6-9, 2014, the resort will host the Boca Grande Invitational Croquet Tournament. The Inn’s lush lawns have also been the site of a myriad of international matches and continually gain the respect of players and spectators throughout the world. From private functions to big events, the croquet lawns at the Inn are the place to be and be seen. So dress to impress, you never know who will be watching. Cool drinks and the perfect view await thirsty golfers at the Inn’s golf & croquet club. Sleek and modern, with a touch of charm describe the main lobby, complete with red, crisp apples for the taking. Every January, guests learn the cooking techniques of leading chefs, taste wines from the world’s most famous regions, and experience delectable cuisine. A specially priced package is offered for overnight guests during this event. The package can include: deluxe accommodations for two, a special welcome reception and dinner, participation in culinary demonstrations and wine tasting events, two breakfasts, a special turndown amenity, final night reception, and the Master Chef ’s Dinner. Make your plans now to be a part of The Gasparilla Inn & Club’s exciting Second Annual Beach, BBQ, Bourbon & Beer Weekend, June 20–22, 2014. The Inn’s Executive Chef Seth Shipley will lead a distinguished group of guest chefs to make this culinary event one of the most memorable celebrations of the season. Park Avenue…in New York City, it’s the epicenter of luxury. In Boca Grande, the same holds true, especially when you’re talking food. 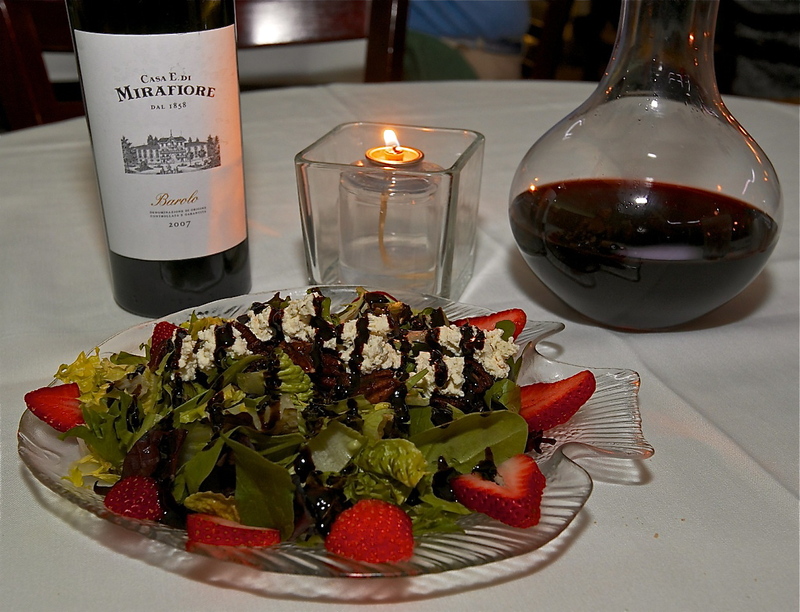 Two of the area’s best epicurean hotspots are located on Boca Grande’s Park Avenue. One part restaurant, one part wine shop. It’s the best of both worlds for diners at the Temp. The “Temp” as it’s affectionately known by locals is everything gourmet and so much more. From the parmesan-crusted Hogfish with a tomato basil chutney, to the raved about Strawberry salad, and an adjoining wine bar with more premium labels than many of America’s best wine stops, it’s a win-win dining experience. Strawberry salad takes on a whole new meaning after one bite of this fan favorite at the Temptation Restaurant. The atmosphere makes the place. Romantic lighting, servers who greet diners in crisp white, pleated shirts and bow ties, jaw dropping food that’s delivered at the perfect temperature, and a wine list that’s solid, affordable and impressive. You have to know the place is great when the owners say their claim to fame has been “word of mouth” inspired. The Temp is booked solid all season. If you want a table, call ahead and know it’ll be worth the wait. Just across the street, a kaleidoscope of colors streams through the stained glass panes and dances on the table at PJ’s Seagrille. Handsome, rich tones adorn the walls of this legendary eatery creating a warm and welcoming atmosphere for diners. Stained glass windows and creative cuisine equal sheer bliss at PJ’s Seagrille. Diverse spaces define this bistro. 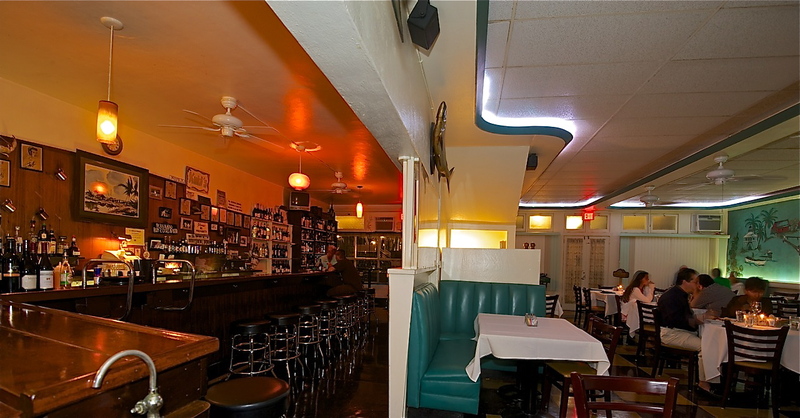 Creative nooks and crannies, an outside patio with small round tables, a sunroom, an upstairs dining area that overlooks the entire restaurant, and a bar with character. Beautiful entrees, presented in style highlight the dining experience. Fresh caught grouper and snapper, and a key lime pie worth every single calorie round out the menu. An afternoon visit for lunch or happy hour is a definite must. The best way to work off all that gourmet food isn’t at the gym. In fact, the most popular way to work up a sweat is by bike, on foot or by golf cart. Best part? 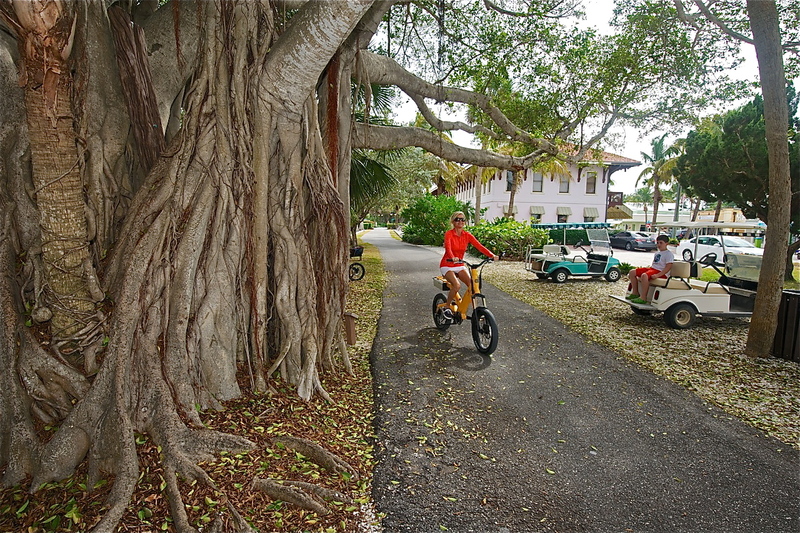 Bike and cart paths span the length of this lush island and provide the best scenery. From bikes, to jogging strollers, beach cruisers, to electric golf carts, or even your own two feet, the only decision you’ll need to make is where to go first. Best way to see the sights of this stellar island community? Electric bike, but of course. Gearing up is easy. If golf carts suit your style, reserve one at the resort or call Gasparilla Inn Adventures to arrange. The Island Bike N’ Beach Shop will ensure you not only get a bicycle of your choice, but you look good riding it. The shop has an array of bikes in neon colors, some with baskets, some with big seats. Rentals are available by the hour, day or week. If you’ve got the need for speed, then check out the wide assortment of electric bikes. With speeds reaching just shy of 20 mph, you’ll be where you need to go in no time flat. Modern and luxe, this mode of transport is a must-have if you want to see a lot of this island in a short amount of time. Ever heard of a golf course without tee times? There aren’t many. The Pete Dye Signature Course at the Gasparilla Inn & Club is the exception. This 18-hole, par 72 championship course is spread over some 6,811 yards and in a word – is breathtaking. 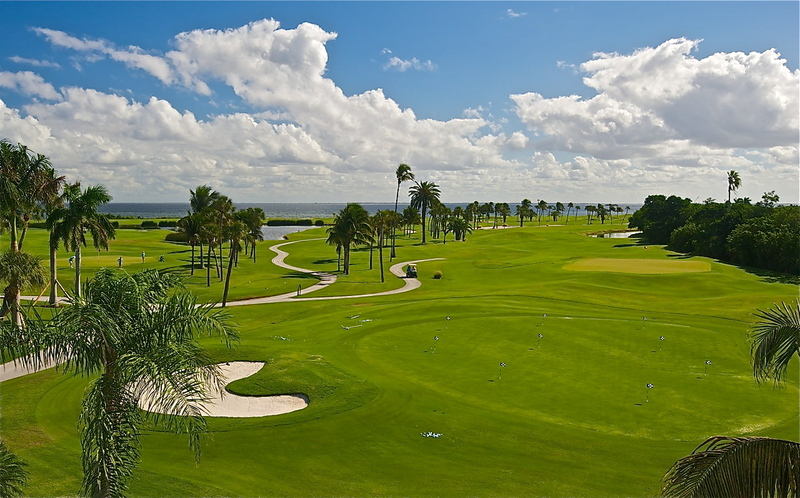 Holes 12 through 17 play directly along scenic Charlotte Harbor. A bird’s eye view of Pete Dye’s legendary links is a sight any golfer would welcome. The course features five sets of tees designed to challenge all levels of players, as well as extensive practice facilities, a golf pro shop, private lessons, and rental clubs. 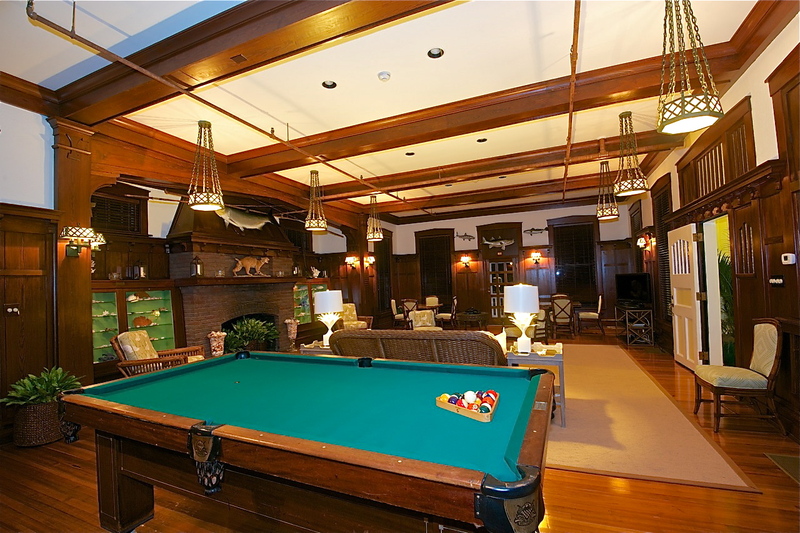 Resort members and guests of the Inn are welcome to play this magnificent masterpiece. Put your golf game to the ultimate test on the world-famous Pete Dye course. Of all the reasons to adore this island community, one of the most popular should be the beautiful sunsets. Orange and yellow with a hint of purple and red, melting into the waters known as the “Tarpon Fishing Capital of the World.” Whether taking a stroll on the beach, or trekking down to the Boca Grande Lighthouse the view rarely disappoints. 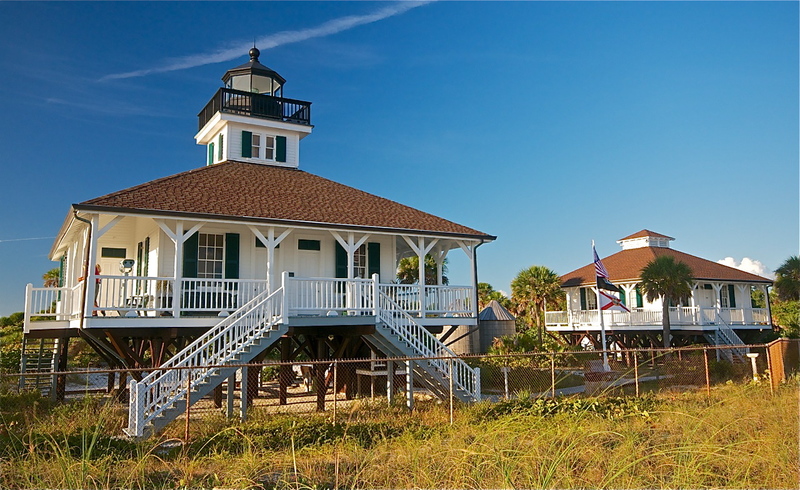 The oldest structure on the island and one of the oldest in Lee County, the Boca Grande Lighthouse was built in 1890 and was operated by the U.S. Coast Guard until 1966. After 20 years of abandonment, and a major renovation, the lighthouse was rededicated in 1986 and is now listed on the National Register of Historic Places. The state assumed ownership of the property opening it to the public as a state park in 1983. The perfect backdrop to any day is a walk on the beach and this stunning sunset, just steps from Gasparilla Inn. The lighthouse remains the ideal backdrop for weddings, gatherings, and special occasions. A landmark lighthouse at the edge of the island keeps watch over the glorious waters and sugar white sands along the Gulf of Mexico. Picturesque and lush with trees so tall and wide you may think you’re in the East Coast’s version of the Redwood Forest. This friends, is the community of Boca Bay. Walkers and bikers have likely passed this neighborhood nestled behind its stately gates and wondered what it would be like to have a home here. This is just one of many upscale places to have a home on Gasparilla Island. Whether seasonal, or full-time, your stay in this refined gated community offers seclusion, serenity and sweeping views of gorgeous landscaping. It’s close enough to town, and far enough away to feel removed from the daily grind. It’s curb appeal at its best, complete with a dash of glamour in the residential suburb of Boca Bay. 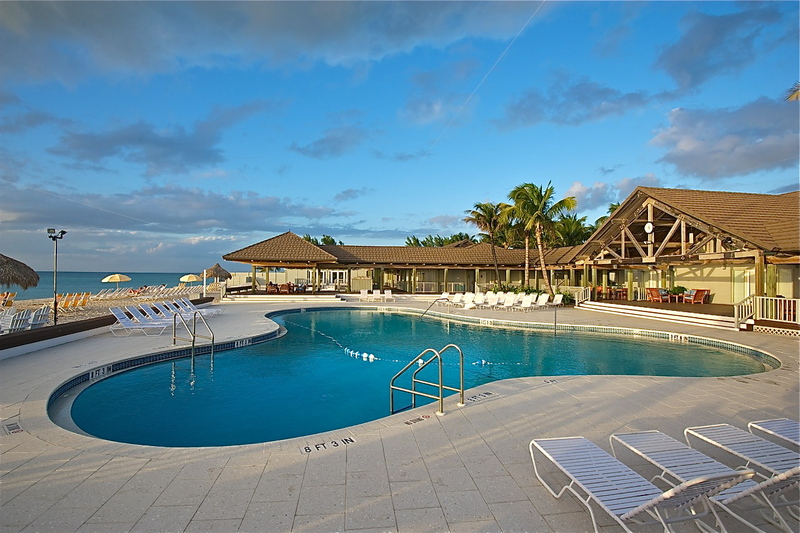 Located just a short walk away from the main resort, The Gasparilla Inn offers a stand alone Beach Club featuring world-class amenities, including a full-service luxury spa, a sparkling white sand beachfront, a palatial pool that overlooks the bay, food and drink service, and a nearby tennis club. Straight out of a design magazine is what you’ll think when setting eyes on the pristine pool at the resort’s beach club. Seasonal spa offerings include wildly popular treatments with names to entice like the Sugar Cookie with a twist Body Glow and Massage, the Pumpkin Pie Scrub and Wrap, and the Warm Cinnamon Massage. So why not pamper yourself with a day of indulgence? 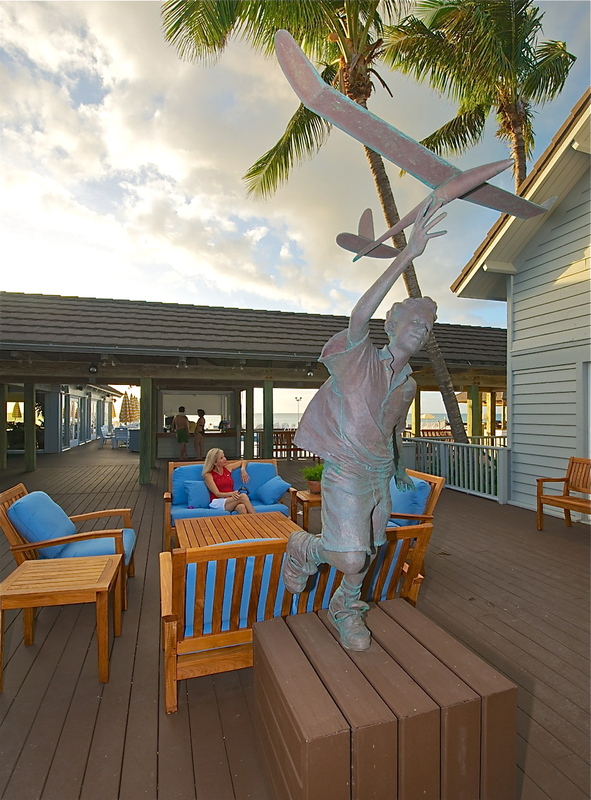 Stunning statues meet dramatic views at the Inn’s Beach Club. A visit to this hidden piece of paradise will leave you with fond memories no average vacation can ever provide. Defining moments, marked by genuine gestures like smiles and handshakes, a time when life seemed so simple. And soon, you’ll want to keep the secret too so no one else knows how truly special Gasparilla Island really is. To read the Luxe Beat Magazine version of this article click on the title Grande Slam. This is an incredible place in so many respects. The Gasparilla Inn’s general manager, Jon Reecher, is a true professional, friendly and has the insight to keep the Inn a jewel for many years to come!